The Society for Immunotherapy of Cancer (SITC) celebrates Cancer Immunotherapy Month™ every June, promoting not only general awareness of the field of cancer immunotherapy, but also providing educational growth and professional development opportunities for clinicians, researchers and patients. What can I do to participate in Cancer Immunotherapy Month™? There are many actions you can take to support both SITC as well as the greater cancer immunotherapy researcher, clinician and patient community. Expand your professional network, become a SITC member today. Sign up for a free SITC CONNECT account. Join the Cancer Immunotherapy CONNECT Open Forum to join the cancer immunotherapy conversation. Download SITC's #WearWhite Flyer and share why you Wear White on June 15! Tweet at SITC (@sitcancer) to share why cancer immunotherapy research is important to you. Also, share photos of yourself proudly displaying your SITC swag. Show your SITC pride! 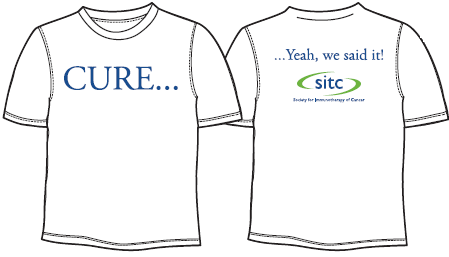 Purchase a SITC Cure t-shirt online or download this order form. Support cancer immunotherapy research and grant opportunities, donate to the Forward Fund. Attend a SITC education program; view upcoming opportunities below or surf to the full SITC Calendar of Events. Improve your understanding of cancer immunotherapy, visit SITC connectED, our society's free online education portal. Thanks for celebrating and honoring the field with us in 2018!